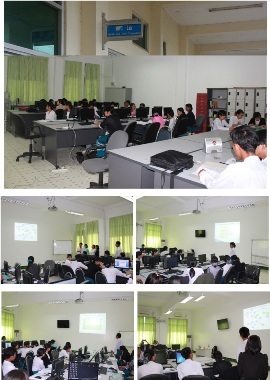 The main purpose of the laboratory is to support research and teaching process related to mobile computing. Laboratory supports research and student projects from multiple domains that can greatly benefit from mobile computing technology such as computer vision, computer graphics, machine learning and augmented reality. Currently the laboratory hardware equipment consists of several mobile devices with iOS, Android. The aim is in near future equip laboratory with computers that will be used for teaching practical aspects of development of native and web mobile applications. The Mobile Computing Lab offers students an environment where they are able to explore as well as develop the skills and knowledge in order to create new technologies, new innovations in order to increase efficiency and usability for individuals. Give students technical expertise, in computer science and software engineering, and practical experience enabling them to be effective in a varied and fast-developing range of careers in distributed mobile and web applications development. Conceive, plan and execute independent work in the field of mobile and web computing. A thorough understanding of the "dimensions of mobile computing" and their impact on mobile application development. To understand the role of information and content systems, and the impact of distributed data and applications on the mobile environment. The primary research focuses of the Mobile Computing Lab are in mobility management, data and service management, security and dependability aspects in mobile computing environments.